It’s amazing how some writers/letterists can mess up something as simple as a stutter (not even touching on what this fear of girls implies). Seriously, “G-G-G-IRL”? That last hyphen is entirely superfluous. It’s the small details that make such a big difference (especially for pedants). … or that her son is named Norman. I’m curious as to why they’re in a d-d-d-dinghy in the first place (and why in such a small space the revelation of feminine gender would cause such consternation for Sam Spade). If I am remembering correctly, they were on an ocean liner that got sunk by an Axis sub, and they spent all night in the dinghy with the woman covered up in a big cowl. Because hey, if you’re in a shipwreck situation, the first thing you reach for is a cowl, right? Anyway, neither of them speak the whole night and next dawn, despite being the only inhabitants of this itty bitty boat and having just survived a horrific ordeal. 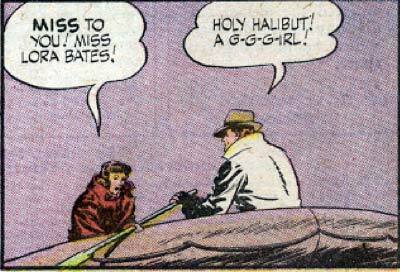 So then you get this panel, where she reveals herself as — GASP! — a G-G-G-Girl! For a guy with radar eyes, Radar’s not the most observant chap in the fleet. The horror! Imagine being trapped on a raft in the middle of an ocean for who knows how long with nothing but a girl to keep you company.